Catalanas usually display a basic light buff plumage with reddish buff hackles. All varieties have a greenish-black tail. They stand on naked legs which are gray or green in color. 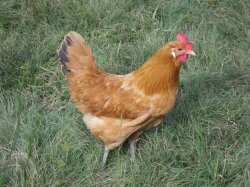 On their heads, Catalanas sport a single red comb, large red wattles, and large white earlobes. They have a horn colored beak and dark red eyes. As in many breeds the five points on the male's comb stand erect in contrast to a hen's comb with one erect point followed by four floppy points. Catalanas need warmth year-round. Consider carefully your latitude prior to purchasing this breed. As a warm-climate fowl, Catalanas live as a true free-range chicken. They like to roam and will need protection from predators. Feed good layer food rich in calcium and protein to support their egg laying. Keep up with hen culling to get the most from their dual purpose status.